It's back to school time. Thomas was taken by surprise and was not happy about this change to his daily routine, which consisted of waking up when he wanted and relaxing in bed until he felt like getting out of it. It was a shock on the first morning when I had to wake him and instead of lounging in his pj's he had to get dressed and head out the door. He broke my heart with his tears, which lasted until he saw the bus. Thankfully he loves school busses and was almost excited to see it. 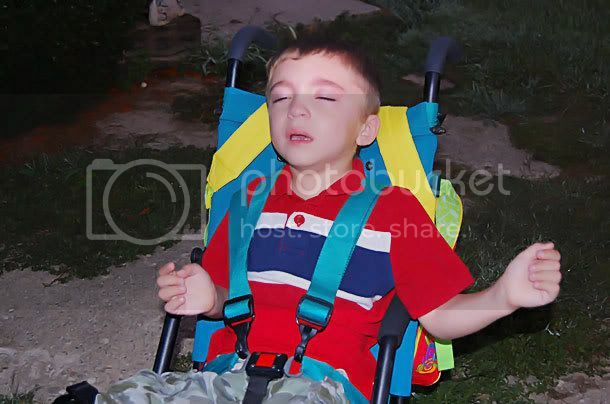 Once he and his stroller were on the lift heading up to the bus, he had stopped crying. When I got to the school with his personal supplies he'd need he had already arrived. His teacher said he wasn't neccesarily happy to be there, but he wasn't crying either. Day two went a little better. I was better prepared for this morning, with a brand new book he could take with him on the bus. 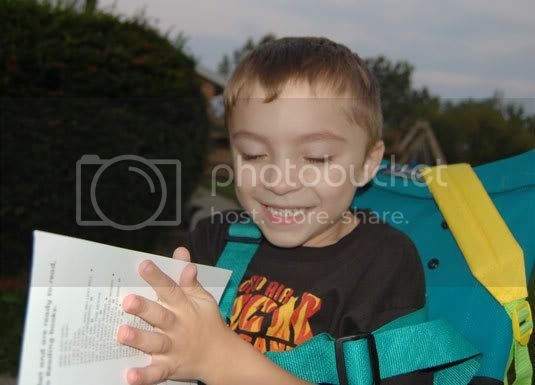 He cried when I got him dressed, cried when I rolled him outside, but slowly became all smiles when I pulled out that book. When he got home I had to put him right in the car and take him to a pt/ot evaluation, but before we got there I took him to Goodwill and we bought probably 25 new-to-us books to help make the next month or two of mornings go as smoothly as day two. Thomas discovered the Wiggles when he was two years old. We were visiting someone who happened to have The Wiggles playing on her tv. After that he just couldn't get enough of the fab four from down under. They have done so much to help his development and it doesn't hurt that they are fun to watch. Thomas first learned to clap by watching and imitating them as they sang "Everybody Clap". We had been working on clapping for over a year in physical therapy, and it only took the Wiggles a few weeks to get him doing it. Now that Thomas can point, he can correctly identify each Wiggle by name and by color, as well as Wags, Dorothy, Henry, and Captain Feathersword. He loves when I help him follow along with the dance moves, and when I need a smile for a portrait I can almost guarantee one by doing a Wiggly dance. 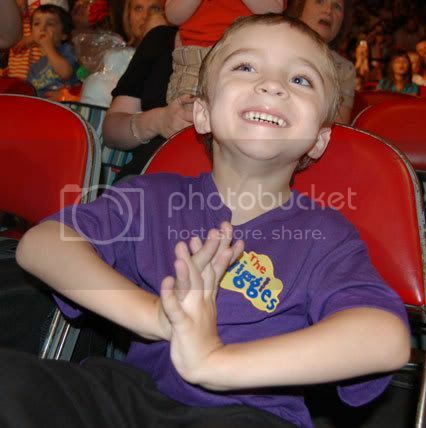 I took Thomas to his first Wiggles concert in 2005. 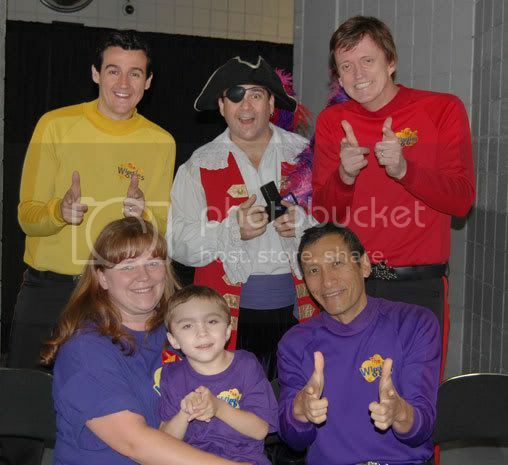 I learned that the Wiggles host Meet & Greets for special needs children before each show, and was lucky enough to get one for Thomas. Thomas was not in a good mood when we arrived at the venue. He was in an even worse mood as we stood in line waiting to meet the Wiggles. At that point he didn't understand where he was or what was going on. He was screaming and crying and just an overall mess. We were at the end of the line so he couldn't see the Wiggles until the very last minute. We finally got our turn and I said to the guys "I'm so sorry, he is not in a good mood today" and of course the Wiggles were great about it. They all spoke at once to tell us it was okay. As soon as they spoke Thomas turned his head from my shoulder and stopped crying mid-scream. He was in total and complete awe. He couldn't stop staring at them long enough to even look at the camera. It was such a great moment, and one of those forever memories you know will always be cherished. Thomas was so happy that day, the entire concert was spent with a constant smile stretched across his face. We went to a second concert that year, but didn't request a meet & greet. Thomas still had the best time. We have since been to 3 more concerts, one per year. By the third year Thomas was so familiar with the venue that he automatically knows what we are doing when we get there. He gets so happy and wiggly in his stroller. 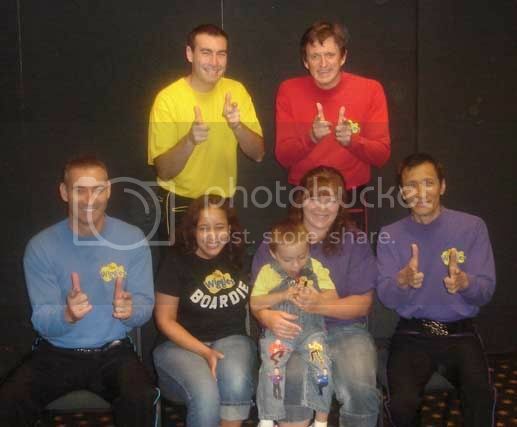 Each year I have applied, and been approved for, a meet & greet with the Wiggles. Sometimes I feel bad about being a meet & greet hog, but when I see the joy on Thomas' face, it doesn't matter. I will do anything to put that smile on his face and that memory in his heart. 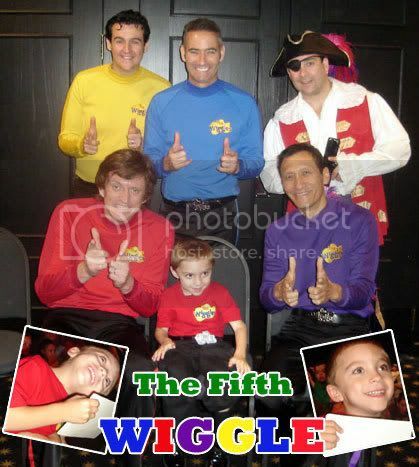 As long as he loves the Wiggles, we will go to their concerts and if possible meet them before the show. First Concert and meet & greet in 2005. 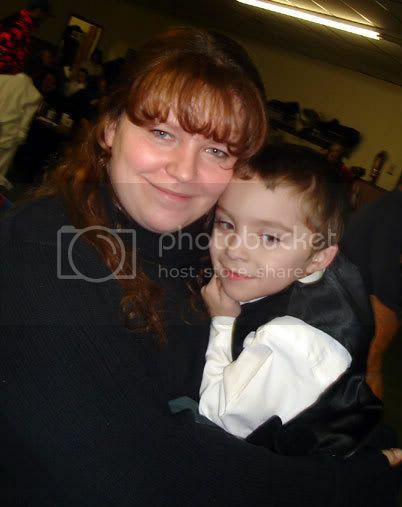 Also in the picture are my aunt and cousin. with our friend "Wiggly" Jo, who makes all our concert attire.